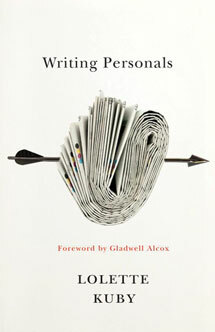 Sylvia Weisler is under contract with a small publisher to write a non-fiction book about personals advertising. She focuses on the middle-aged and older group who utilize print media rather than on the "too vast territory" of twenty-somethings and the Internet. Interviews with a variety of "persons"-people who place and respond to ads-appear throughout the book. Some of these characters remain interviewees-material for Sylvia's book; others, however, enter the author's private life and become enmeshed in the plot. This is held together by the major narrative thread-Sylvia's own search for love. Lolette Kuby's books include two poetry collections, Set Down Here and Inwit, and an acclaimed work of literary criticism, An Uncommon Poet for the Common Man: A Study of Philip Larkin's Poetry. Her book Faith and the Placebo Effect: An Argument for Self-Healing was a finalist for the 2001 ForeWord Magazine Book of the Year Award in the Health category. Kuby grew up in Cleveland and now lives in Toronto. 184 pp 8.5" x 5"